Blue Jackets at Rangers at 7:00 p.m. | Pregame at 6:30 p.m.
Reds at Pirates at 7:00 p.m. | Pregame at 6:30 p.m.
Cavaliers at Warriors at 10:30 p.m. | Pregame at 10:00 p.m.
Cleveland, Cincinnati, Charleston/Huntington, Louisville/Lexington, KY, Dayton, Ohio Counties of Ft. Wayne DMA, Toledo Outer: The game is being made available to providers to air on the plus FOX Sports Ohio cable channels. Alternate channel information can be found here. Toledo-Lucas County, Bowling Green, KY/Knoxville, TN, Wheeling/Steubenville: The game is being made available to providers to air on the plus FOX Sports Ohio cable channels. Channel information can be found here. 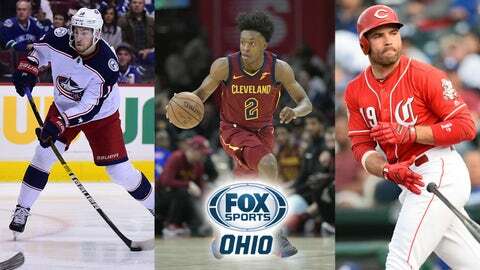 Cincinnati, Charleston/Huntington, Louisville/Lexington, Dayton, Ohio Counties of Ft. Wayne DMA, Toledo-Outer: The game will air on the plus FOX Sports Ohio channel upon the conclusion of Blue Jackets coverage. Channel information can be found here.